The Salty Donut, a shop combining artisanal doughnuts and coffee, was created with a “one-stop shop” philosophy in mind. “We spent so much time … making sure our coffee is amazing, because what is a good doughnut with crappy coffee?” asked Amanda Pizarro, co-owner of The Salty Donut and soon-to-be University of Miami alumna. In just over a year, The Salty Donut has upgraded from a pop-up mobile shop to a brick-and-mortar location in Wynwood, and it has become a household name for South Florida’s foodies. Plans for a second location are already being discussed. Co-owners Pizarro, 24, and her fiance, Andy Rodriguez, 29, are frequent travelers. Their city-hopping inspired them to bring a doughnut shop to Miami. However, the plan didn’t come to fruition until fall of 2015, when Pizarro enrolled in her first marketing course at UM. One of the class assignments was to design a business plan, and Pizarro convinced her group members to outline the details of a doughnut shop. This project was the boost she needed to start the business venture, and five-year goals, a business plan and investors for The Salty Donut soon followed. Pizarro put her dual degree in accounting and finance on hiatus but will return to UM this fall to finish her marketing degree and graduate. “Even though it took exactly one year from when our pop-up opened to when our store opened, I’m so glad that we did that because we just learned so much and … were able to prepare for when the store opened,” Pizarro said. As for Pizarro’s favorite item on the menu? It’s the brown butter and salt cake doughnut, “the black sheep,” as she described. Pizarro claims that the hallmark of a great doughnut shop is a good cake doughnut, and she knows that her favorite helps them meet that criterion. 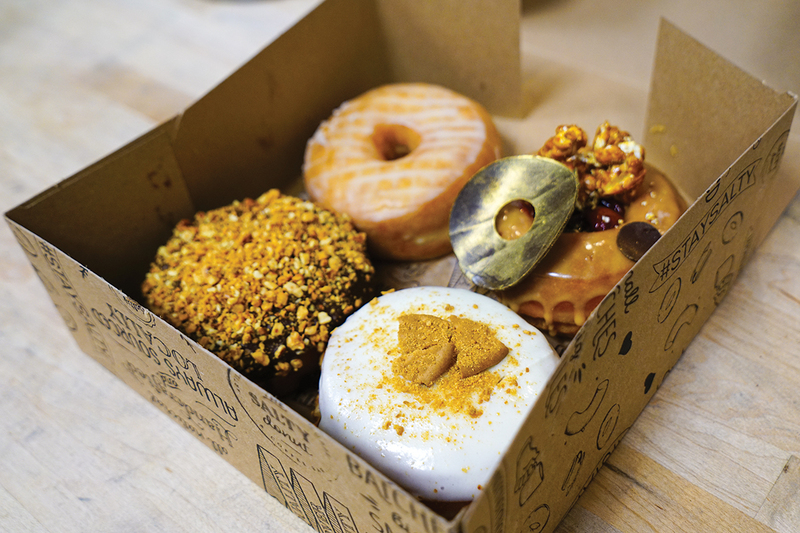 Customer favorites are the maple bacon and traditional glazed doughnuts, but the store’s co-owner and executive pastry chef, Max Santiago, continue to seek flavor inspiration everywhere, such as dessert menus, Pinterest trends and seasonal ingredients. Pizarro has been baking since she was 10 years old and has always had an entrepreneurial spirit. So much so that, at one point, she was baking weekly and handing out business cards. The irony of this was not lost on her. “All my friends and family were like, ‘You realize that technically you’ve been doing this since you were a kid,’” Pizarro said. A childhood dream come true? That’s just the icing on the doughnut. Head out to the Rock Tuesday, Feb. 7 at noon to enjoy some of The Salty Donut’s treats during HP Presents: Donut Go Breaking My Heart, hosted by HP Daytime Programming & Special Events. For more updates, keep up with The Salty Donut on Facebook, Instagram and Twitter.